I love this picture. I took it over Spring Break during the last year of my BA. I was incredibly stressed out... I was working frantically on my thesis so I could finish on time. It was the first day of the year that was warm enough for the snow to melt, so some of my friends and I decided to go play Frisbee outside. I can't throw a Frisbee worth a lick, but we still had fun (and got covered in slush). 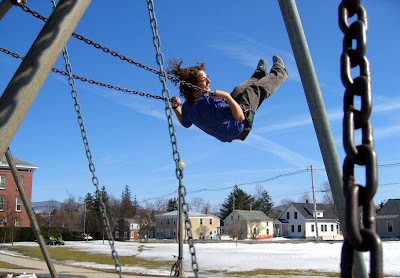 Then we started playing on the swingset, and I snapped a couple pictures just for fun. I'm really stressed out right now... Exams are in a month, and I haven't been able to devise a good study plan. I have two study-intensive exams (and four not-study-intensive exams), and I just can't focus on them. If anyone has some good study strategies to impart, I would appreciate it.